Aloe plants are native to Africa and the surrounding regions, there are about 400 species in the genus. Of these, about five are commonly found in cultivation. The most famous is Aloe vera, which has been used medicinally for centuries. 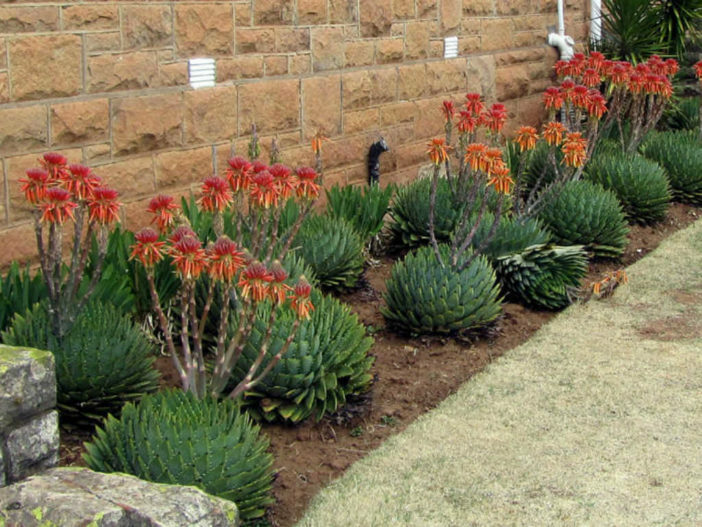 All plants are succulents, forming low rosettes of lance-shaped fleshy leaves or, in the case of Aloe arborescens, growing into a taller, bare-stemmed plant topped with 10-inch leaves. Many kinds of Aloe have relatively harmless spines on their leaves, but it’s still worth being careful. Besides A. vera, attractive varieties include A. aristata and A. variegata. Light: Strong, bright light. They can withstand full summer sun, once acclimated. In the winter, provide bright light. Water: Water generously in the summer and nearly cease watering in the winter. Do not let water stand in the rosettes. Temperature: Prefers warmer temperatures of 70 to 80 °F (21 to 27 °C), but will survive down to 40 °F (4.5 °C). Soil: A well-drained potting mix is essential; use a cacti or succulent mix. Fertilizer: Feed with a cactus fertilizer in the summer only. Suspend feeding in the winter as the plant goes dormant. During repotting of a larger plant, it is possible to carefully divide the root ball. Some kinds of Aloe will send off off-sets that can be potted independently. The plants are not particularly fast-growing and will only rarely need repotting. Repot plants in the spring that are tipping over their pots or have ceased growing. Use a fast-draining potting mix with one-third sand or pebbles. Aloe is a very forgiving plant, and a well-grown plant can be quite beautiful. The variegated Tiger Aloe forms bunches of low rosettes with green bands on wide leaves. As with all succulents, it’s essential that it is never allowed to sit in stagnant water, and the plant should be carefully monitored to watch for signs of overwatering. Many people keep a pot of A. vera in the house to use the juice from the fleshy leaves on burns and minor skin irritations. Plants will almost never flower in cultivation.